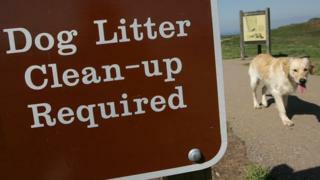 A local authority has approved plans to fine dog walkers who leave home without poo bags regardless of whether their pet makes a mess or not. Daventry District Council is believed to be the first authority to bring in the measure, which could see owners given £100 on-the-spot penalties. The extra power for enforcement officers comes in the form or a Public Space Protection Order (PSPO). It takes effect on 1 December, but fines would not be levied until 2016. The plan was put out to public consultation earlier this year and the council said there was "overwhelming support for the proposal by residents and local groups". The council said there would be a month of offering advice and warnings to dog walkers before the fines were enforced in January. Mike Warren, councillor for health issues, said: "We will be advising them to make sure they have extra poop bags with them at all times to ensure they have the means to pick up, regardless of how long they've been out and about with their pet. "These new powers are not intended to penalise the many responsible dog owners, who should be assured that our officers will be taking a common-sense approach on their patrols. "It's not unreasonable though, for example, to expect someone who has just arrived at a venue to walk their dog to be carrying poop bags." People caught with their dog and no plastic bags could face prosecution and larger fines if they unsuccessfully contest an on-the-spot fine.